I don’t usually promote many products unless they’ve proven themselves worthy of my arsenal. It’s spring break on my campus, which means I can finally tackle the stack of almost-due interlibrary loaned books and articles printed back in January. Among the stack was one gem which I highly recommend to all academic librarians. School librarians will definitely find inspiration and ideas to modify. Even my public brothers and sisters will find themselves inspired by the projects described in Student Engagement and the Academic Library (2012), edited by Loanne Snavely. Each chapter describes in good detail a projected aimed at engaging students more directly with their library. Some focus on academic engagement while others just want students to walk in the door. 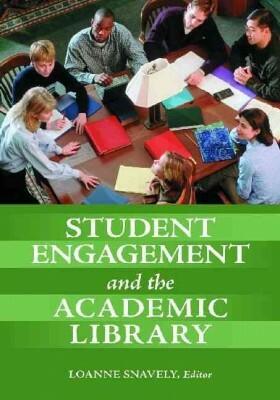 Engagement is broadly defined here, which makes the book accessible to non-academic librarians. The definition also acknowledges the idea of the whole student and the myriad roles libraries and librarians can play in student life. Libraries and librarians are encouraged to view themselves beyond the materials and services currently provided in order to remain relevant. The issues we face (and always will) are complex and the authors here understand we must take multi-pronged approaches. We must not become mired in a chorus of “they all use Google.” We must define our value and share that value with students in meaningful ways. Some of my favorite projects described include a librarian hosted-and-themed radio show on the student radio station. I was also impressed with a live action game featuring a college president as a magician, a new take on the student-led marketing campaign, and a librarian-led student service learning class. The projects and activities go beyond the tried-and-true scavenger hunt. They ask librarians to consider the real experiences and values of students in ways both serious and fun. Students learn how library research can impact free reading programs in their communities. They can discover that librarians are real people with actual taste in music. They can feel noticed and encouraged by librarians. Most of the authors offer theories to ground their ideas and assessment of projects. All of them will make you feel energized and inspired about your job and all of its possibilities.